Pagkauwi ni Juan, nagtanong siya sa kanyang tatay kung ano ang sagot sa number one. Juan: Tay! Anu po ang sagot dito sa number one? Tatay: (Kumakanta sa Videoke) Dahil mahal kita! Pumunta si Juan sa labas upang tanungin ang kanyang nanay ang sagot sa number two. Juan: Nay! Ano po sagot dito sa number two? Nanay: (Nakikipag-away sa kapitbahay)P*t*ng in* mo! Pumunta si Juan sa harap ng pintuan ng kubeta. Juan: Kuya ano sagot dito sa number three? Kuya ni Juan: (HIndi narinig dahil kumakanta) DOon sa kubeta! Doon sa kubeta! Pumunta si Juan sa labas ng bahay. Juan: Bunso! Bunso! Ano sagot dito sa number four? Bunso: (Nakikipag-laro ng Pasko-Paskuhan) Thank u! Thank u! Thank u very much, Thank u! 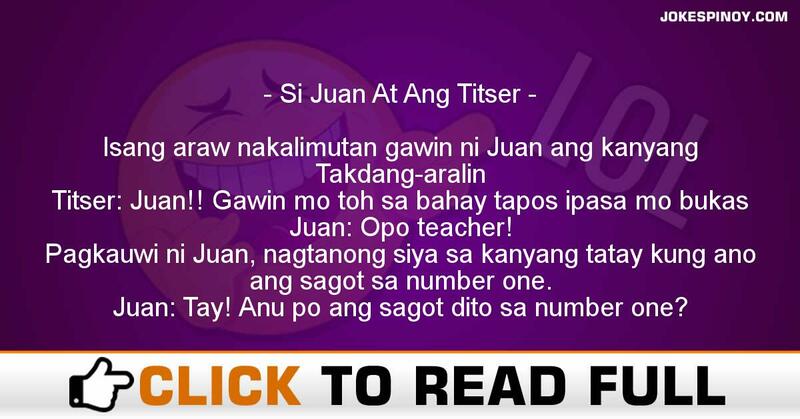 Titser: Juan! Bakit mo toh pinagsasagot ng gan2! Titser: Saan mo toh nakuha Juan! Juan: Doon sa kubeta! Doon sa kubeta! Juan: Thank u! Thank u! Thank u very much, Thank u! ABOUT US : Laughter is the best medicine as the old saying says, we at JokesPinoy.com will supply you with all the comical filipino quotations and photographs in tagalog language. Back in 2013, a group of Filipino OFW (Overseas Filipino Worker) got bored and they try to look for some humorous quotations online just to have fun but sadly most of the websites they found on that time are having an outdated jokes and have no interaction with the users. From that instant, they subsequently got an idea to build their very own jokes website and let other users to give their jokes or comment with the existing jokes. Following the funds and concepts accumulated, JokesPinoy.com was born, a website that let the user share their jokes and let them have dialog with other users as well. Since the website has been launching, thousands of visitors are coming each day to read jokes and have fun on the website and also as giving their opinion on the jokes they read. We hope from JokesPinoy.com this website may give you some grin and happiness, Life is Short so have fun on it. DISCLAIMER: A number of the jokes, photos and videos found in this site are not created by us, they may be created by our users or they just get it someplace in the internet only like 9gag, youtube, metacafe, vimio and etc. We respect copyright info which is posted here including funny pictures and funny videos. If encase there are files posted here in our site that is owned by your and you don't need to share it to anybody afterward fell free to contact us to remove it. Majority of the language used on this particular site was in tagalog and some are bisaya that are both filipino language which originated from Philippines, if you would like to translate the joke to english you can used an online translator to translate it from tagalog to english.